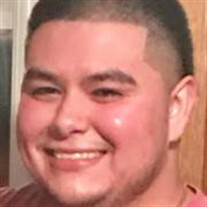 Angelo Rodrigo Hernandez, 23, passed away June 18th, 2017. He was born February 8th, 1994 in Newport, Arkansas. He enjoyed listening to music, playing video games, time spent with his friends and his family, and especially time spent with his brother and sister. He was preceded in death by his maternal grandmother Graciela Gutierrez. He is survived by his maternal grandfather Santos Gutierrez; his paternal grandparents Miguel Rodriguez and Maria Rodriguez; his father Jose Rodriguez; his mother Lisa Rodriguez; his brother Joe Rodriguez; and his sister Christin Rodriguez; as well as several aunts, uncles, cousins, and friends. Visitation will be Friday, June 23rd from 5-8 PM at the Willis Funeral Service Chapel. A funeral service will be Saturday June 24th at the Willis Funeral Service Chapel at 2 PM.